Buzău (/bu'zəw/) is a county in southeastern România. In Hattrick this region has the ID 789. Buzau has 734 active users and one of the biggest number of Hattrick Supporters: 48 users representing 7% of them. 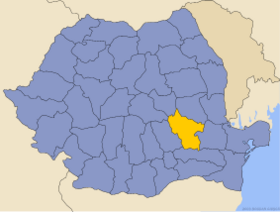 This region is one of the oldest from România being included from the beginning of the Romanian league. Other well known users are: Don-CoachDinamo (he was the coach of U20 National Team of Moldova), PGCalin, oieru, Husky, Boogie, Sonny22, Sadu1, heruvim, Dark_Fukrer, Rector, Ni3tzsche, Alanbzzz. To meet them and many others please visit Buzau county conference in Hattrick. This page was last edited on 26 June 2007, at 08:43.